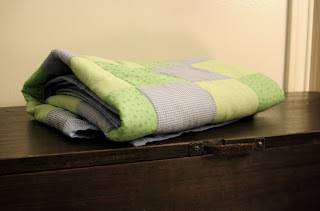 I have made my first quilt – a simple patchwork quilt! It has lacked the binding for over a week and I finally convinced myself to take the time to finish it! It looks really good, it is not perfect but it is my first quilt so I didn’t expect perfection! It’s an odd shaped quilt but I was learning as I went! 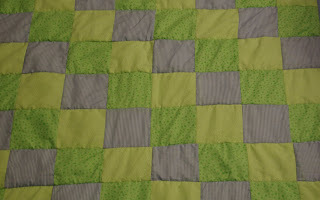 I cut out squares from 3 different fabrics and sewed them together to make the quilt top. I was surprised how simple sewing the quilt top really was! It’s a perfect size for a baby! 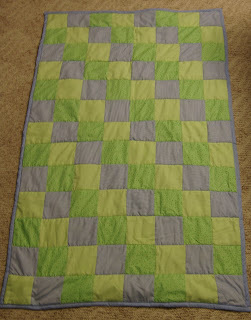 How sweet will it be to have our future children snuggle, picnic and use a quilt made by their mama – my first quilt!